The ‘Project 33 – Capacity Building of Cultural Institutions in Novi Sad for Strategic Planning’ aimed at giving professional education and support to cultural managers in Novi Sad, enters the third phase of the implementation. 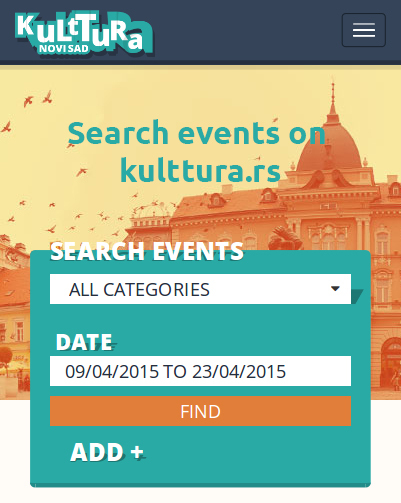 It was launched with the support of the ‘Novi Sad 2021’ Foundation, the City Administration for Culture, Provincial Secretariat for Culture, Public Information and Relations with Religious Communities, and the UNESCO Chair of the University in Belgrade, and it will contribute to the participative and collaborative making of the five-year strategic plans of the cultural institutions, as well as creating the mechanism for more intensive involvement of the citizens of Novi Sad in processes related to culture in the city. Mr Dalibor Rožić, Member of the City Council in charge of culture, addressed the audience on that occasion. This project is another indicator of the joint action of all city institutions and all levels of government in the implementation of the common goal – the successful presentation of Novi Sad as the European Capital of Culture in 2021. Vuk Radulović, on behalf of the ‘Novi Sad 2021’ Foundation, is pleased with cooperation with cultural institutions in Novi Sad, the UNESCO Chair, and the University of Arts in Belgrade. ‘The analysis and the preparation phases are over, and I will remind you that the first phase was dedicated to education for the development of strategic plans implemented by some of the most important experts in European cultural policy. We are very pleased that the previous evaluation showed that the representatives of the institutions are satisfied and optimistic about the implementation of the project of strategic planning. If everything goes according to the plan, Novi Sad will become the first city in Serbia, in which all cultural institutions have their five-year plans and vision of development, which, we believe, belongs to one European capital of culture,‘ Radulović said. Višnja Kisić, PhD, and Goran Tomka, PhD, authors and project managers at the UNESCO Chair of Cultural Policy and Management of the University of Arts in Belgrade, agree that joint, long-term and planned ventures such as the ‘Project 33’ are extremely rare around the world, and this is the first time that one city systematically deals with the issue of strengthening the institutions of culture. ‘We see the support, education and mentoring in the field of strategic planning as an opportunity to strengthen the cultural scene and cultural needs of citizens and visitors of Novi Sad and Vojvodina. Therefore, this whole process was a call to think how to make numerous cultural institutions more united, coherent and better cooperative, but also how the institutions can work even more actively, more engaged and open, as well as how cultural creativity can raise important social issues and challenges. That is why the outcome of strategic planning will not only be making of strategic plans that most institutions write for the first time, but new knowledge, connections among people, mutual trust and a new enthusiasm’, said Kisić and Tomka. This project is divided into three phases: education, individual work and work with mentors. The completed second phase announces the beginning of the third – work with mentors, in which each institution will receive a mentor who will lead teams through the process of work on the development of the plan. It is planned that this phase lasts 4 months, from April until August 2019, and as a result, all institutions participating in the project will create and adopt five-year strategic plans. Following the Strategy of Cultural Development of the City of Novi Sad 2016-2026, the ‘Project 33’ will provide strategic direction, better coordination and cooperation among cultural institutions and intersectoral connectivity, as well as better preparation of the ‘Novi Sad 2021 – European Capital of Culture’ project. The project began at the end of October 2018.